Biology is the study of every living things in life. Small intestine is the main site of digestion in which most ingested food of mammals is digested and absorbed in the small intestine. The size human small intestine is about 4 cm in diameter and 7 to 8 m in length It is intermediate in length between the small intestines of typical carnivores and small intestine of herbivores of similar size, and it reflects the human’s omnivorous eating habits. The length of the small intestine directly relates to the total surface area available for absorbing nutrients, as determined by the many circular folds and minute projections of the inner gut surface (figure a). On the circular folds, thousands of fingerlike projections called villi. Villi project from each square centimeter of mucosa (figure b). 300 m2—the size of a tennis court. The first part of the small intestine, called the duodenum, functions primarily in digestion. The duodenum consist of many digestive enzymes that intestinal glands in the duodenal mucosa secrete. The pancreas secretes other enzymes. 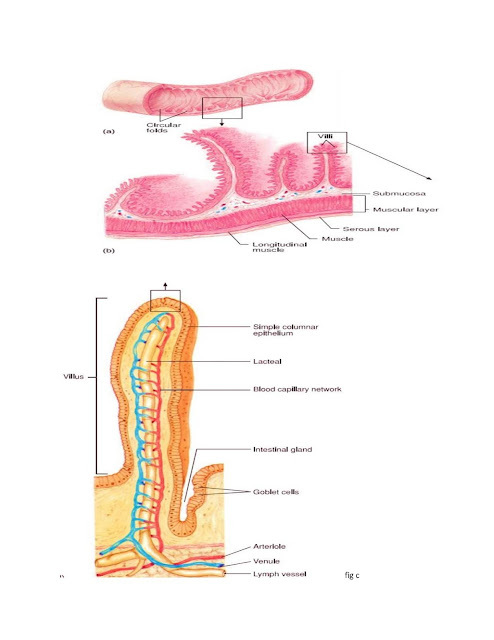 In the duodenum, digestion of carbohydrates and proteins is completed, and most lipids are digested. The next part is the jejunum, and the last part is the ileum. Both function in nutrient absorption. The jejunum and ileum absorb the end products of digestion such as, amino acids, simple sugars, fatty acids, glycerol, nucleotides, water. Much of this absorption involves active transport and the sodium dependent ATPase pump. small droplets called chylomicrons, which enter the lacteals of the villi. From the lacteals, the chylomicrons move into the lymphatics and eventually into the bloodstream for transport throughout the body. Besides absorbing organic molecules, the small intestine absorbs water and dissolved mineral ions. The small intestine absorbs about 9 liters of water per day, and the large intestine absorbs the rest. Endocrine System of Mammals and their Function---- Hormones? What is respiratory pigment and give their types? What are Types of Circulatory Circuits? What IS CHARACTERISTICS OF INVERTEBRATE? Which are the types of vertebrates glands?